Back Bay Books, 9780316259156, 304pp. Beatles vs. Stones. Biggie vs. Tupac. Kanye vs. Taylor. Who do you choose? And what does that say about you? Actually--what do these endlessly argued-about pop music rivalries say about us? Music opinions bring out passionate debate in people, and Steven Hyden knows that firsthand. Each chapter in YOUR FAVORITE BAND IS KILLING ME focuses on a pop music rivalry, from the classic to the very recent, and draws connections to the larger forces surrounding the pairing. Through Hendrix vs. Clapton, Hyden explores burning out and fading away, while his take on Miley vs. Sinead gives readers a glimpse into the perennial battle between old and young. 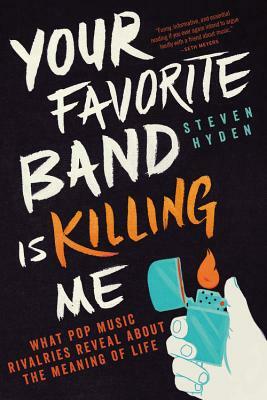 Funny and accessible, Hyden's writing combines cultural criticism, personal anecdotes, and music history--and just may prompt you to give your least favorite band another chance. Steven Hyden has written for Uproxx, Grantland, The A.V. Club, Rolling Stone, Pitchfork, Slate, and Salon and is the author of Twilight of the Gods: A Journey to the End of Classic Rock and Your Favorite Band Is Killing Me: What Pop Music Rivalries Reveal About the Meaning of Life. He lives in Minnesota. "With sharp, nail-on-the-head observations, Steven Hyden dives into the minutiae of what we all know is the most important conflict of modern times but are too embarrassed to admit: Who is the cooler band? Who is the better band? Why are they better/cooler? Are they better because they are cooler, or vice versa? Have I blown your mind yet? Then just imagine what this book will do. "—Adam Scott, star of Parks and Recreation and Party Down and co-host of U Talkin' U2 to Me?